January 28, 2012: The Diamond Exchange #4 | Esc.rec. January 28, 23:00-3:00 hrs. 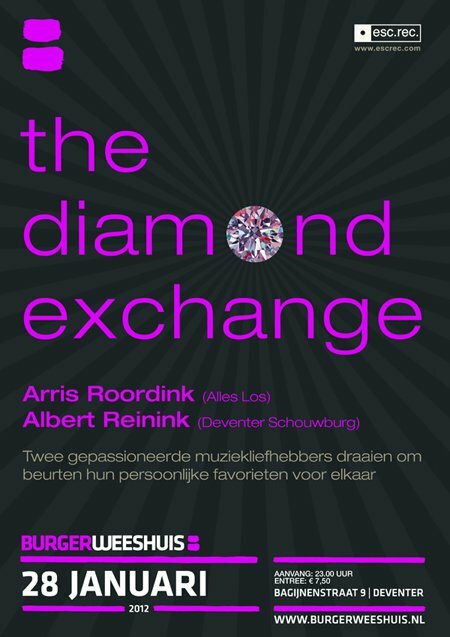 in Het Burgerweeshuis, Deventer: The fourth edition of The Diamond Exchange, with Arris Roordink and Albert Reinink. You have to pay 7,50 euro to get in, but then you also get to enjoy Deventer Dub Sessions with Red D + Makam Live + Davy Brandts.